These highlights do not include all the information needed to use ELAPRASE safely and effectively. 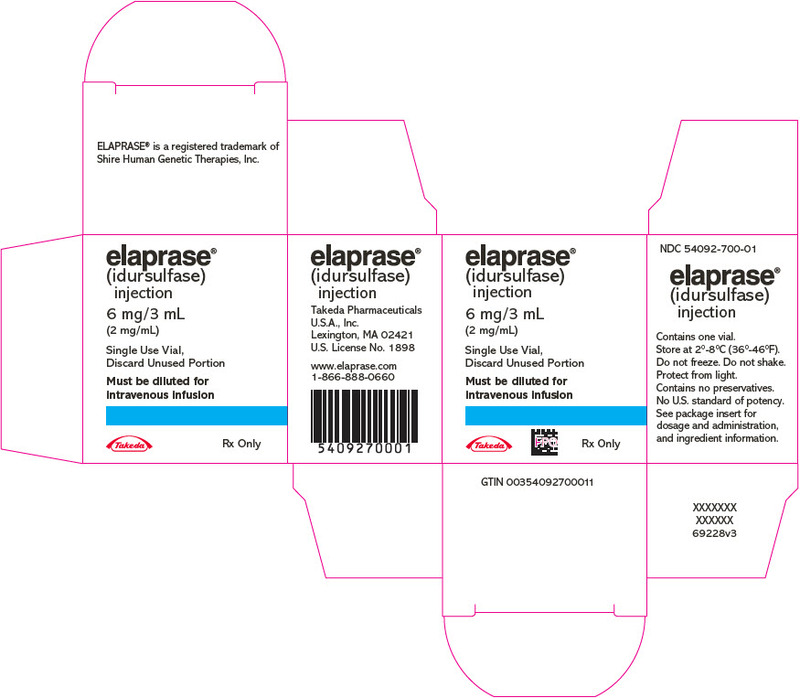 See full prescribing information for ELAPRASE. ELAPRASE is a hydrolytic lysosomal glycosaminoglycan (GAG)-specific enzyme indicated for patients with Hunter syndrome (Mucopolysaccharidosis II, MPS II). ELAPRASE has been shown to improve walking capacity in patients 5 years and older. In patients 16 months to 5 years of age, no data are available to demonstrate improvement in disease-related symptoms or long term clinical outcome; however, treatment with ELAPRASE has reduced spleen volume similarly to that of adults and children 5 years of age and older. The safety and efficacy of ELAPRASE have not been established in pediatric patients less than 16 months of age (1). The recommended dosage is 0.5 mg per kg of body weight administered once every week as an intravenous infusion (2). Hypersensitivity Reactions Including Anaphylaxis: Ensure that personnel administering product are adequately trained in cardio-pulmonary resuscitative measures, and have ready access to emergency medical services (EMS) (5.1). Risk of Hypersensitivity, Serious Adverse Reactions, and Antibody Development in Hunter Syndrome Patients with Severe Genetic Mutations: Hunter syndrome patients aged 7 years and younger with complete gene deletion, large gene rearrangement, nonsense, frameshift, or splice site mutations experienced a higher incidence of hypersensitivity reactions, serious adverse reactions, and anti-idursulfase antibody development (5.2). Risk of Acute Respiratory Complications: Patients with compromised respiratory function or acute febrile or respiratory illness may be at higher risk of life-threatening complications from hypersensitivity reactions. Careful consideration should be given to the patient's clinical status prior to administration of ELAPRASE and consider delaying the ELAPRASE infusion (5.3). The most common adverse reactions occurring in at least three patients (â‰¥9%) aged five years and older were headache, pruritus, musculoskeletal pain, urticaria, diarrhea, and cough. The most common adverse reactions occurring in at least three patients (â‰¥10%) aged seven years and younger were pyrexia, rash, vomiting, and urticaria. In all clinical trials, the most common adverse reactions requiring medical intervention were hypersensitivity reactions, and included rash, urticaria, pruritus, flushing, pyrexia, and headache (6.1). To report SUSPECTED ADVERSE REACTIONS, contact Shire Medical Information at 1-866-888-0660 or FDA at 1-800-FDA-1088 or www.fda.gov/medwatch. Table 1 summarizes the adverse reactions that occurred in at least 9% of patients (â‰¥3 patients) in the ELAPRASE 0.5 mg/kg once weekly group and with a higher incidence than in the placebo group. Additional adverse reactions that occurred in at least 9% of patients (â‰¥3 patients) in the ELAPRASE 0.5 mg/kg every other week group and with a higher incidence than in the placebo group included: rash (19%), flushing (16%), fatigue (13%), tachycardia (9%), and chills (9%). An open-label extension trial was conducted in patients who completed the placebo-controlled trial. Ninety-four of the 96 patients who were enrolled in the placebo-controlled trial consented to participate in the extension trial. All 94 patients received ELAPRASE 0.5 mg/kg once weekly for 24 months. No new serious adverse reactions were reported. Approximately half (53%) of patients experienced hypersensitivity reactions during the 24-month extension trial. In addition to the adverse reactions listed in Table 1, common hypersensitivity reactions occurring in at least 5% of patients (â‰¥5 patients) in the extension trial included: rash (23%), pyrexia (9%), flushing (7%), erythema (7%), nausea (5%), dizziness (5%), vomiting (5%), and hypotension (5%). A 53-week, open-label, single-arm, safety trial of once weekly ELAPRASE 0.5 mg/kg treatment was conducted in patients with Hunter syndrome, ages 16 months to 4 years old (n=20) and ages 5 to 7.5 years old (n=8) at enrollment. Patients experienced similar adverse reactions as those observed in clinical trials in patients 5 years and older, with the most common adverse reactions following ELAPRASE treatment being hypersensitivity reactions (57%). A higher incidence of the following common hypersensitivity reactions were reported in this younger age group: pyrexia (36%), rash (32%), and vomiting (14%). The most common serious adverse reactions occurring in at least 10% of patients (â‰¥3 patients) included: bronchopneumonia/pneumonia (18%), ear infection (11%), and pyrexia (11%). • Serious adverse reactions included: bronchopneumonia/pneumonia, ear infection, and pyrexia [see Adverse Reactions (6.1)]. • Positive anti-idursulfase antibody (Ab) is defined as having at least one serum specimen with measurable antibody during study duration. • Eight of 18 patients with positive Ab had no measurable concentrations at Week 27. • One patient in the placebo group and one patient in the ELAPRASE group died before Week 53; imputation was by last observation carried forward in the intent-to-treat analysis. • ANCOVA model based mean ± SE, adjusted for baseline disease severity, region, and age.